The Medishield Life Review Committee has just released the full Medishield Life Report. If you haven’t already done so, you will also want to read my Medishield Life summary. The bad news is that premiums are going to double or triple for the younger age groups. The good news is that there will be temporary subsidies for everyone and permanent subsidies for the lower income. However, everyone will feel the full burnt of the premium increases from 2019 onwards when the transitional subsidies ends. 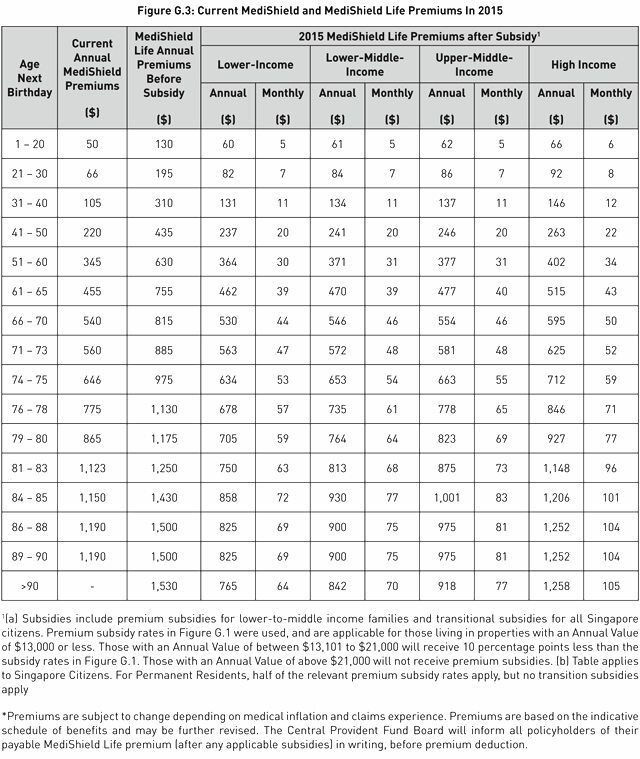 One observation I made was that for some age bands, the new Medishield Life premiums (that is meant to provide coverage for B2 and C wards) is even higher than the current premiums for the private integrated shield plans that can coverage for B1 or even A wards (page 100 of report)! This is very bad news for all integrated shield plan owners. More significantly, shifting the premium cost of Medishield Life downwards towards the younger age group. See page 14 of the report, “Distributing Premiums More Evenly”. Even then, I wonder whether the premiums are set too aggressively. With regards to this aspect, the call by the committee for more transparency on the Medishield fund is a good one (page 72). A new recommendation that has not been announced previously is the push for government to regulate a standardized integrated shield plan that provides coverage up to B1 level (page 79). The maximium Medisave withdrawal that can be used to pay for Medishield approved plans should also be set at that level (page 80). I think this is a good idea that will suit the needs of many Singaporeans. The committee also spoke about the duplication with Group Employer Benefits (page 85), which is something that I wrote about previously : The Benefits of Portable Medical Plan. The committee urged employers and unions to work on this problem together. 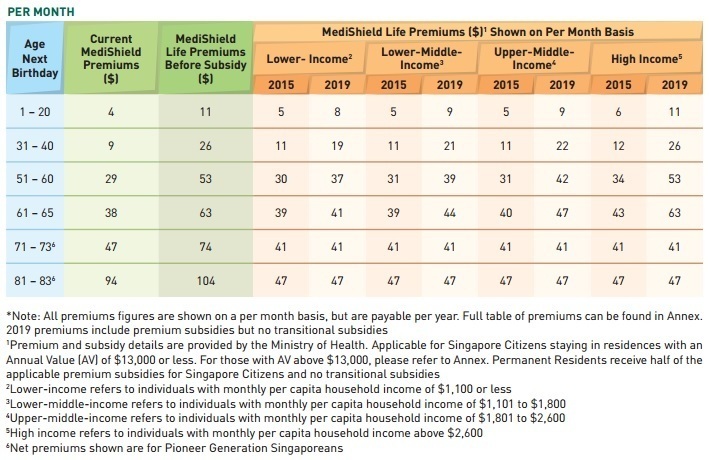 Anyway, now that the premium values are available (see below), I will be able to finish my article on the relationship of Medishield Life with the private integrated shield plans, and what are the factors to consider in deciding whether to keep or drop the plans. Hope to get it completed sometime next week. Who Needs to Pay Additional Premiums for Medishield Life? Would Means Testing apply for the Medishield subsidy for the pioneer generation ? You can relax … answer is nope. However means-testing still applies for B2/C ward billing for pioneers. Unless govt changes policy going forward. Since most of them would have stopped working by now, it will impact mainly those who stay in private properties. I am currently with AIA IP paying a premium of 518/annum this year, took my agent to task for that whopping increase…haha. What should i look into prior to deciding whether to switch back to Medishield Life OR stay with current IP? Like I mentioned in my earlier post http://www.martinlee.sg/time-drop-integrated-shield-plan/ there are many things to consider. Look out for my upcoming article next week, which I will try to address all the factors. Really appreciate what you are doing here. In 2013, I asked Aviva to give me a breakdown on the money deducted. 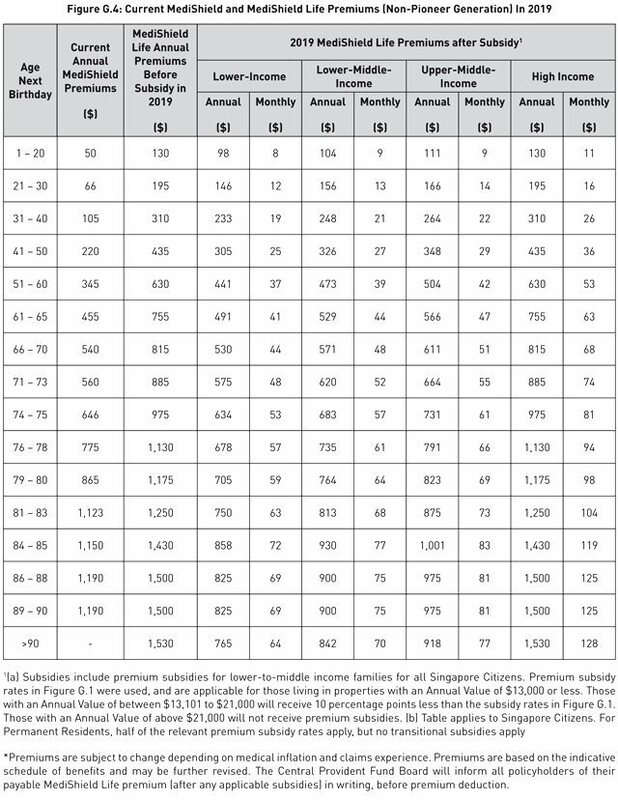 Assuming cost of IP remains the same and to make calculations simple, I am expected to pay $263 + $522 in 2015, $630 + $522 = $1152 in 2019 ! There is a cap in the contribution of Medisave A/C. Once the money in the a/c runs low especially when one is not working, how can the payment of premiums including IP be sustainable? Also, we are looking at premiums till 2019/2020, what’s next? Already told you all. 2X to 3X increase for majority of people (majority of population still below 55 for now). Inter-generational transfer of wealth whereby the younger people from 0 to 40 have to pay 3X or more. The only surprise for me was the 0-20 age group also not spared — I guess the authorities figured that parents will still be willing to pay for their own children’s protection. The 40s and 50s age group is basically a doubling of premiums. And then the authorities try to soften the increase for those 60++. 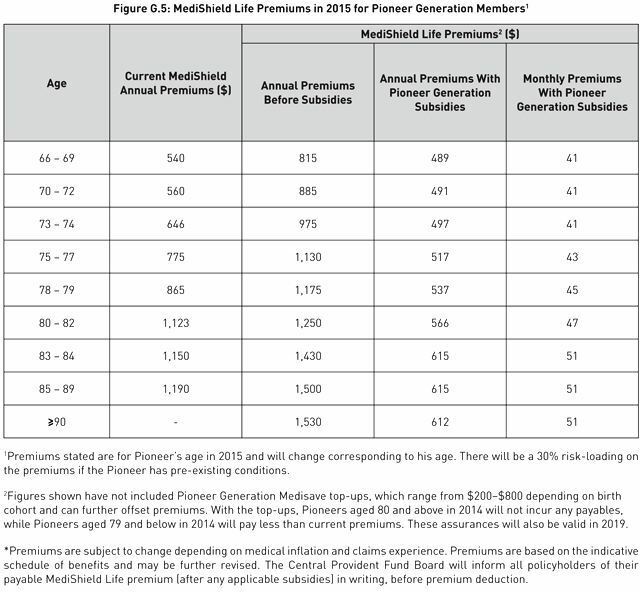 BTW, don’t forget these new premiums are based on medical costs & claims as of 2013. By the time the subsidies are withdrawn by 2019, the premiums across-the-board would have been raised. In fact, I think they will need to review & increase the premiums around 2017. Premiums for healthcare insurance have been undergoing review & increase every 2-3 years. This has been happening especially since the last inflation spikes in 2007/2008. A major contributor to medical inflation has been the govt’s unwillingness to hard-cap medical costs & prices, as it will affect S’pore’s attractiveness as biomedical & pharmaceutical hub. As for whether to give up private IP, need to wait for actual confirmation of revised premiums. But I fully expect it to be very bad. I expect the premiums for the IP to increase by the same or similar increase for Medishield Life. For the plans that cover private hospital, the premiums might increase by even more. Could you share some information on the column “current annual medishield premiums”? It seems odd. Each insurer has different packages with different premiums. How are the numbers derived? The current Medishield premiums refer to the current premiums charged by Medishield. This is the same paid by everyone no matter which private integrated shield plan they are under. For example, it is $105 for the 31-40 age group. If your private plan charges you $200, they will keep $95 and pass $105 to Medishield. I suppose there is no point in underwriting a brand new policy when one is already in operation. Thanks for the information, appreciate it. I would be expected to pay $263 but in 2019, my annual premium would almost triple to $630 as I will enter into the next age band. This is excluding the portion from IP. How am I going to bite this bullet? Those without stable job and low pay e.g. daily rated or low-level service jobs, will be even worse shape. There are almost 1 million Sinkie workers getting $1800 or less each month (and this $1.8K is gross salary including all year-end bonuses and OT). This is the number getting Workfare as a result of even govt admitting they’re not earning enough to survive properly in S’pore. Of these 1 million, 30% of them are earning $1000 or less. Sure they get subsidies, but even paying $441 instead of the higher $630 is already a life-and-death struggle for them. Many will have to beg, borrow, steal to pay cash because their salary is barely sufficient to build up money in their CPF and Medisave. Especially if their jobs and salaries are irregular types, hire-and-fire environment, paid only if called on duty.